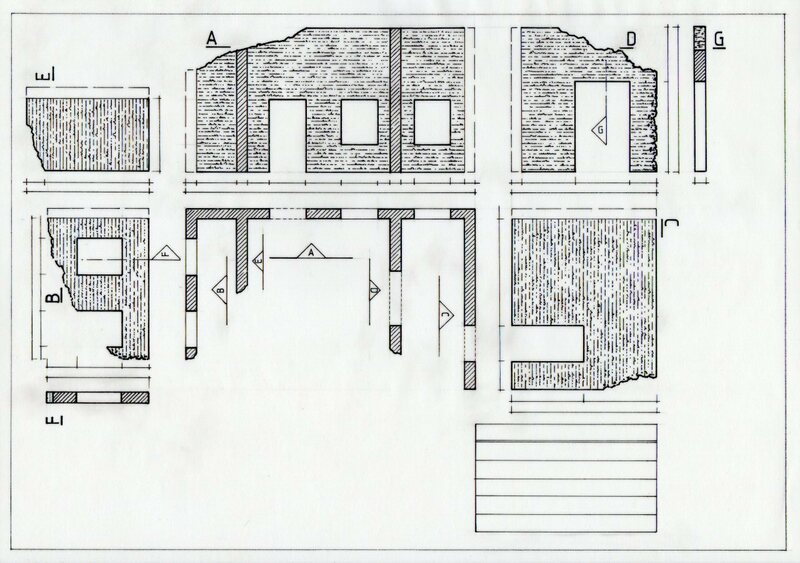 For example, the simplest method when cross-referencing parts on the same sheet would be to label or ‘code’ a drawn view of a wall as ‘Elevation A’ and place the same ‘A’ beside its representation on the ground-plan. Both the style and the symbols do vary. In whatever case though, it must be made clear not only the direction of view but also the ‘point’ in space seen from (especially with sections). The most common method, shown above, is to enclose the letter within a triangle which points in the direction of view. The base of the triangle (here extended either side) represents the position in space seen from. ‘Coding’ is also employed to indicate when information about an element or structural detail can be found on a separate sheet. 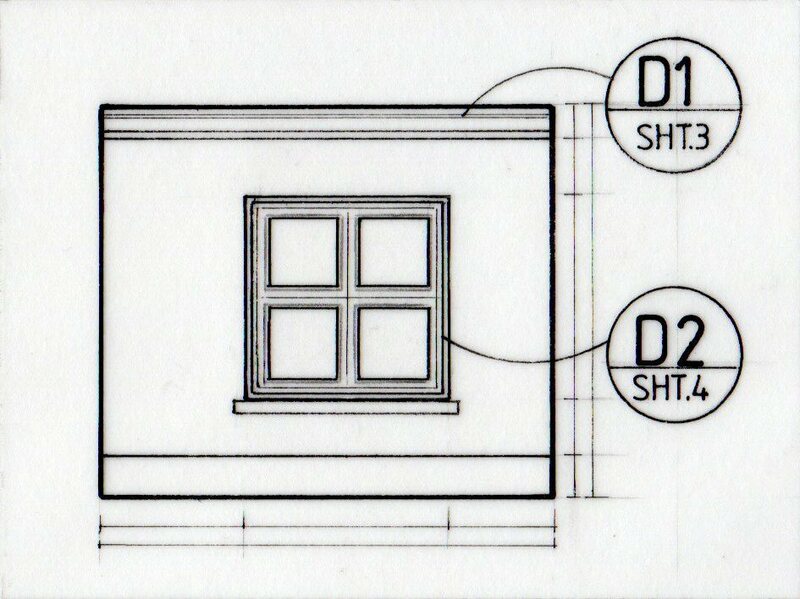 Above for example, the circular labels indicate that larger-scale drawings for the cornice ‘D1’ can be found on sheet no.3 and for the window-frame ‘D2’ on sheet no.4. Details are often coded with the letter ‘D’ accompanied by a number, and this style of dividing a small circle in half is also a favourite. Since most of the lines making up a technical drawing are straight, horizontal or vertical, these circles stand out and the information is also nicely ‘contained’. Obviously one fairly common-sense ‘rule’ is that the letter ‘A’ or ‘A-A’ (describing the extent of the view) should only be used once (that is, to refer to one thing) on the same sheet to avoid confusion, but it can be used for something else on a separate numbered sheet. 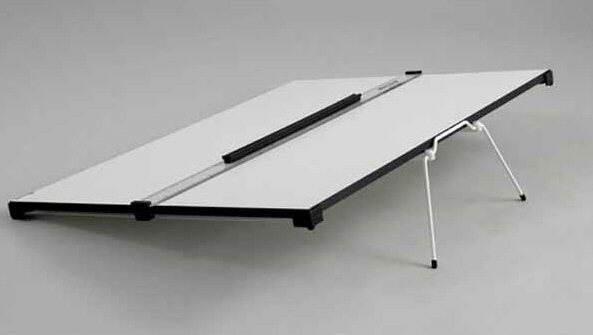 Blundell Harling ‘Challenge’ A1 drawing board recommended as an adequate, inexpensive option. Has a convenient carrying handle. Needs to be looked after because the mechanism and parallel bar are the most basic and not super-durable. Normally parallel bars are not meant to be interchanged (i.e. they are calibrated in centimeters in case this is useful but normally the desired scale rule is placed on top for measuring work). There is no ‘feet and inches’ bar available. The ‘Challenge’ has only one moderately raked position, as shown below. If you need one with more upright options there is the ‘Ferndown’ which is more expensive. Blundell Harling ‘Challenge’ A1 (£61.19 inc VAT graphicsdirect.co.uk, £65.99 amazon). ‘Ferndown’ with variable stand, costs more (e.g. RRP is £120, currently £87.48 inc VAT at graphicsdirect.co.uk or c.£90 at cassart.co.uk). Prices from August 2015, not changed since August 2014. The ‘upright’ views .. i.e. front view or side views, in everyday language .. are commonly called ‘elevations’ in technical drawing, because they’re usually taken up or ‘elevated’ from the ground-plan. Wherever possible this relationship needs to be maintained on the sheet, for a number of reasons. In the first place, if dimensions are plotted on the ground-plan first they can be reproduced on the elevation just by using a set square and without the need to measure out again. Secondly, if the two views are in exact alignment it’s much easier to read them in conjunction to explain features. Thirdly, one set of written measurements will usually serve for both views. 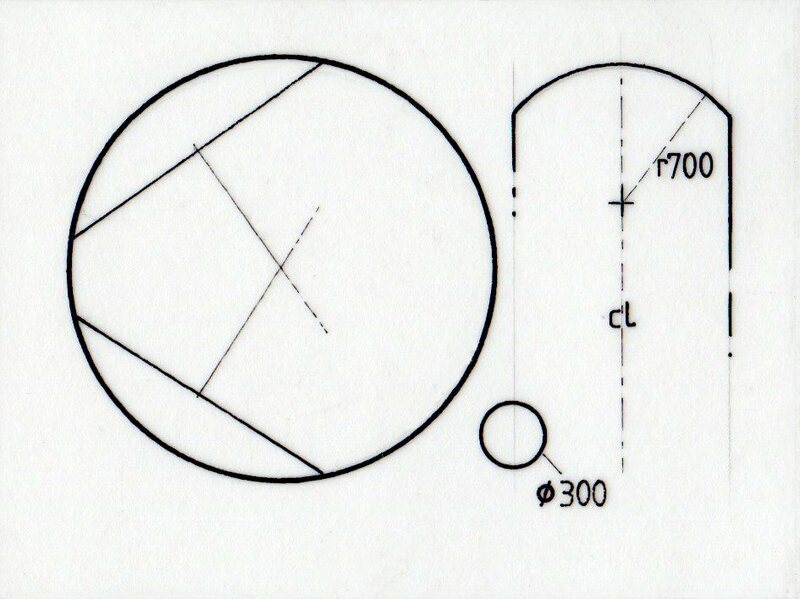 Anything that has required the positioning of a centre to draw it has to include the clear position of that centre on the drawing, usually with a precise but definite ‘X’ or ‘+’ cross, a dotted line linking that to the curve it relates to and a written measurement for this radius marked with a small ‘r’. Unless of course .. the circle is very small in which case just the diameter is given, often with a little symbol like an ‘o’ with a line through it (below). The arch on the right also includes a clear centre-line, marked ‘CL’. Also illustrated by the large circle above .. if you need to find the centre of a circle: pick two points on the circumference, draw line between them, bisect this line and draw right-angle from that point. This line will pass through the centre. If you do the same from another part of the circle, the centre will be where these two lines cross. This is a clever little trick which can sometimes work out quicker than measuring, using the calculator and fiddling with small fractions .. though it can only be done using the drawing board. Below, ‘A’ represents the object to be divided, whether a line or an area, and I want to divide it into 7 equal parts. First of all lines ‘R’, at both top and base, need to be extended at right-angles to it. You then need to take a scale ruler and look for a scale where 7 equal divisions would produce a line a little longer than the original line (it doesn’t matter what scale in this case .. it’s just a source of equal divisions). 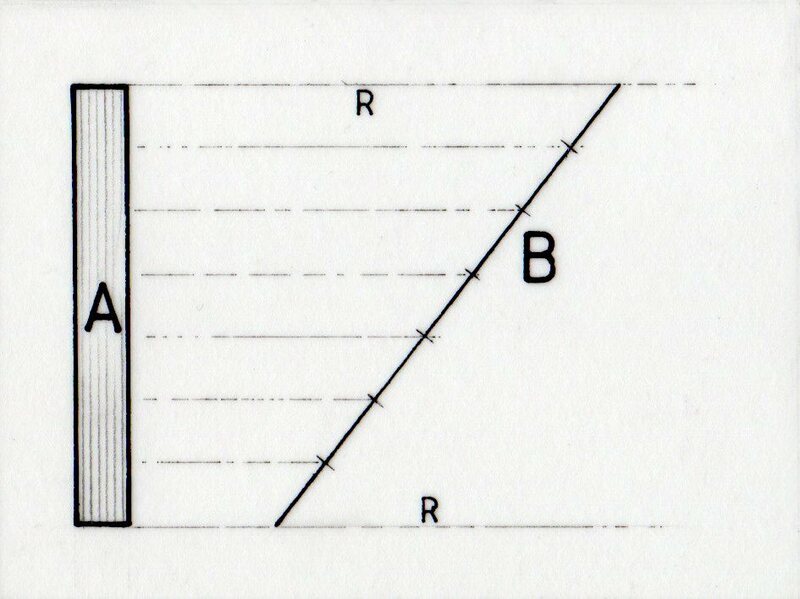 I’ve had to slant the ruler to fit the 7 divisions between the two right-angled lines drawn, and this is represented by ‘B’. Those divisions are marked off on line ‘B’ and further parallel lines drawn back from these points to meet line ‘A’ .. giving it 7 equal divisions. It is always best practice to include at least a version of the ground-plan view relevant to the structure being represented on the same sheet .. even if this is a simplified one .. so that this can be directly referenced, to better understand the context of the parts. The main ground-plan may be more detailed. Interrupting the line i.e. if a structure or distance needs to be shown condensed (because the whole can’t be fitted on the paper, or space needs to be saved). Shown with a wavy or jagged break line.. or two, spaced a little apart. Obviously this is only an option if no information is lost by doing this i.e. for a completely plain wall or a regular pattern. What’s most important is that the true length of the wall should always be clearly indicated with a written measurement. Layout has to be rehearsed rather than made up/added to as one goes along. It is not necessarily easy to achieve a balanced layout i.e. one where the parts are close enough to read the relationship but not so close that they encroach on each other. The easiest way to rehearse this (rather than draw/erase different outline possibilities on the full-size sheet) is to draw provisional versions of the object views on small sheets first and then find the best arrangement by moving them around underneath a full-size sheet. Once decided these can be traced. Another way is to make up a smaller ‘model’ i.e. smaller-scale paper cutouts of the principle views needed together with a similarly reduced sheet so that positions can be easily played with. Yet another easy way using SketchUp is to mark out a sheet size i.e. A1 or A2 in ‘scale’ within SketchUp on the ground plane, make outlines of the views required on that sheet and use the ‘Select’ and ‘Move’ tools to move them around until they look comfortable. Before recent improvements in photocopying, drawings always had to be made on transparent paper (commonly known as tracing paper or draughting paper) and almost always in ink, so that they could be reproduced by the dyeline method. Now drawings made on normal white paper are just as easily replicated. But there are many advantages to being able to trace when working on a technical drawing i.e. tracing from other drawings, tracing printed lettering, tracing repeated elements, and so on. Tracing paper also generally remains cleaner or at least can be cleaned more effectively. Even thick pencil lines can be removed with no trace and ink can be scratched away (though this is rather painstaking) with a scalpel or razor blade. However there are drawbacks, especially when using ink. The paper surface should not be touched too much because grease from the fingers sits on the surface and interferes with the ink. Hands must be rested while working on piece of scrap paper or cotton gloves should be worn. On the whole it is not wise to display original drawings done on tracing paper if you want to exhibit your drawings. However thick, they will be affected by heat and humidity, and although they may have an ‘agreeable’ look the lack of contrast can make them difficult to read. It is better to mount a good copy on foamboard. It is traditional practice to align written measurements to be read ‘from bottom upwards’ and ‘from left to right’, just those two directions, rather than following all four directions. Often space will dictate whether the measurement values should be written parallel to the measurement lines or at a right-angle to them, but where possible they should run in the direction of the line. Also, detail measurements are positioned closest to the object, followed by larger measurements, then an overall measurement. The reader should be able to locate the overall dimensions easily, without having to search and should certainly not have to add parts up! This could lead to mistakes. The question of whether the numerals should be written above or below the measurement line, or whether there’s a gap in the middle to insert them, is purely personal preference .. and in this case can even be varied if need be according to available space. As mentioned elsewhere .. there should certainly be room for personal style! There may be no absolute necessity to represent surfaces or materials in a graphic way (as long as that information is noted somewhere), but it can enhance the drawing, even make it clearer. There is a lot of freedom in representing surfaces, such as a decaying brick wall or bark of a tree, by whatever means you choose as long as it’s not misleading (i.e. it should stick to the intended appearance, rather than too graphically stylized) and as long as it will copy well. Most often only a representative portion of a significant surface needs to be indicated, such as brick pattern on the bottom left corner of a wall elevation. Filling the whole of the wall surface with this pattern may diminish the clarity of other details as well as taking unnecessary time. Window areas which are to be ‘glazed’ are commonly represented by 2-3 short diagonal strokes in each pane, or just the word ‘glazed’ .. but again, the diagonal lines look ‘better’ and take less time. Again, this is not a necessity but one can choose to include a figure to represent scale and it is well worth it in some instances i.e. showing clearance under overhead walkways or stair units. Obviously if a figure drawing, in whatever style, is included the most important thing is that it represents an ‘average’ in terms of size. According to the US publication Interior Graphic Standards the current height average is 1.75m for a male, 1.63m for a female (2014). 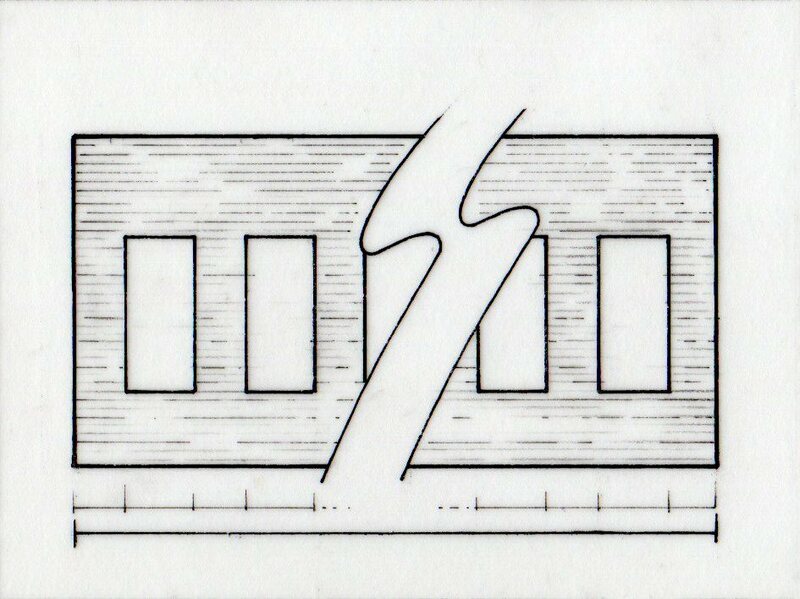 Title block or ‘title box’ containing production title, drawing title (if not prominently elsewhere on the drawing), name of designer (production designer, art director), drawn by, date (or dates), drawing number in the series (i.e, ‘Drawing 1 of 5’), principle scale (other scales may be indicated next to part of drawing). The title block is often consistently in the same place (usually lower right corner) so that it can always be looked for there, and so that it’s visible when sheet is folded in the standard way. If there are lots of sheets, it may be worthwhile to design ‘sheet number’ to read larger, so that it can be more immediately seen. Rather than spend so much time mapping out guidelines etc. for the even shape and spacing of lettering why not print out the words or sentences you have to include in a clear, simple and enlarged font, place underneath the sheet and trace. There are good quality plastic stencils available for smaller lettering i.e. for technical notes and writing dimensions. A common problem when working with ink pens (though not so much with the fibre tip) is the ink being drawn underneath the edge of the ruler (or set square, or French curve etc.) if the nib is placed too close. For this purpose good rulers or set squares often have at least one edge which has a slight overhang to prevent this, but it never completely eliminates having to be careful. Linex ‘College’ brand, clear light-brown tinted. Good weight and thickness .. not too heavy, not too light. Reasonably finished edges. The 45degree ‘36cm’ size is a good large average without being unwieldy, combining fairly good reach with stability (36cm is measure of longer diagonal side, as with tv monitors). £7.32 at LGC, hellermans.com £4.92 (£4.10 plus VAT), cheapest seen for £4.27 on eBay August 2014 (not inc. postage).